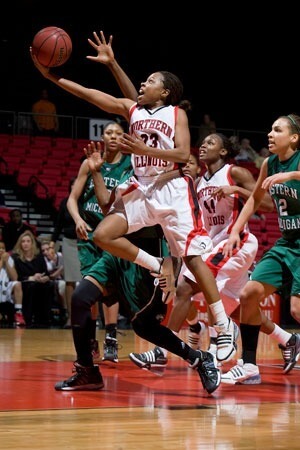 Northern Illinois University men’s and women’s basketball action at the Convocation Center is right around the corner. Basketball season tickets, including a combined men’s basketball/football or men’s basketball/women’s basketball season ticket packages, are priced at just $86. Faculty and/or staff, along with senior citizens, can also purchase men’s basketball season tickets for $86. For the general public, the 15-game men’s basketball season ticket package is just $100, while season courtside seats for “the best seats in the house” are $400. Overall, men’s basketball season ticket holders receive a 33 percent discount off the cost of each single game seat. 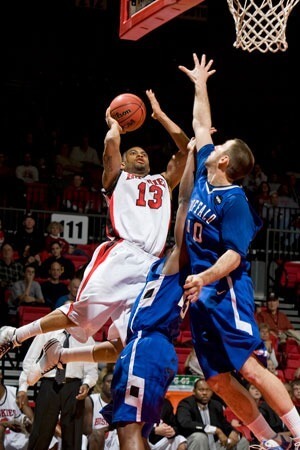 In addition, Northern Illinois will offer a five-game season ticket mini-plan in 2010-11 for Huskie men’s basketball. Through the mini-plan, fans can attend any five NIU men’s home games and sit in the same reserved seat for just $35. Women’s basketball season tickets cost just $50 for the general public, while a season courtside seat package will be priced at $100. Through the various packages, fans can receive up to a 48 percent discount for general public season tickets this season, along with a 58 percent discount for faculty/staff and senior citizens. Fans also can take advantage of the new “Huskie Value Pack,” 10 general admission vouchers good for any men’s or women’s home game, priced at $30. The Value Pack enables one fan to see any 10 games, or bring a group of 10 fans to just one game. It can be used in any combination for any number of games throughout the 2010-11 basketball season. Season ticket renewal forms for men’s and women’s basketball were mailed out last week. Single-game tickets, along with new season ticket holder packages, can be ordered through the Huskie Athletic Ticket Office beginning Monday, Oct. 4. Call the office at (815) 752-6800 or click on the “Buy Tickets” banner. The NIU men’s basketball team, under the fourth-year leadership of head coach Ricardo Patton, will play 14 regular season home games, and one exhibition contest, versus Coe College, on Saturday, Nov. 6. First-year head women’s basketball coach Kathi Bennett will see her team play 12 home contests, along with the exhibition game against UW-Parkside on Wednesday, Nov. 10. Weekday home games for both men’s and women’s basketball will start at 7 p.m., while weekend home contests are slated to begin at 3 p.m. NIU will host a doubleheader Saturday, Jan. 15, at the Convocation Center with the women playing Western Michigan at 1 p.m. and the men taking on Toledo beginning at 3:30 p.m. The Huskie men’s basketball season opener against Northwestern is scheduled to tip-off at 8 p.m. Friday, Nov. 12, to accommodate the NIU volleyball team’s previously scheduled 6 p.m. home match versus Eastern Michigan at Victor E. Court. Reserved lower-bowl tickets for each of NIU’s men’s basketball home games will cost $10 while general admission adult seats in the upper bowl will run just $8 each. General admission tickets for senior citizens and/or youth will be priced at $6. A general admission Family Pack offers four tickets for just $18. Groups of 20 to 49 people will receive a discounted price of $3 per ticket, while groups of 50 or more will pay just $2 apiece. For women’s basketball, reserved lower bowl tickets will cost just $8 in 2010-11 while general admission adult seats in the upper bowl are priced at only $6 each. General admission tickets for senior citizens and/or youth will run just $4 apiece while the group prices will cost just $3 (20-49 people) and $2 (groups of 50 or more), respectively. The women’s basketball general admission family pack will cost just $12. NIU students are admitted free to all Northern Illinois Athletic events with a valid OneCard. For ticket information anytime, including information about group tickets, and to keep up with all the latest Northern Illinois sports news, go online to NIUHuskies.com or call the NIU Athletics Marketing Office at 815-753-1923.